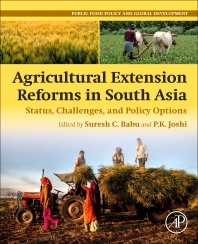 Agricultural Extension Reforms in South Asia: Status, Challenges, and Policy Options is based on agricultural extension reforms across five South Asian countries, reflecting past experiences, case studies and experiments. Beginning with an overview of historical trends and recent developments, the book then delves into country-wise reform trajectories and presents several cases testing the effectiveness of different types (public and private) and forms (nutrition extension, livestock extension) of extension systems. Further, the book provides a comprehensive overview of challenges and constraints faced in formulating and implementing reforms, tying the results into a concrete set of lessons and highlighting areas that require further research. In addition, the book discusses how a major aspect of agricultural development is the productivity increase from the knowledge base of farmers, and how translating research results into a knowledge base for farmers requires designing and implementing well-functioning extension programs. Suresh Chandra Babu is a senior fellow and a program leader at the International Food Policy Research Institute (IFPRI) in Washington, D.C and extraordinary professor of agricultural economics at the University of Pretoria, South Africa. Before joining IFPRI as a research fellow in 1992, Dr. Babu was a research economist at Cornell University. He has published 20 books and monographs and more than 100 peer-reviewed journal papers on food and agricultural policies in developing countries. He has conducted research on food and agricultural policy in developing countries for the past 30 years. He has held visiting or honorary professorships at American University, Washington, D.C.; Indira Gandhi National Open University, India; University of Kwazulu-Natal, South Africa; and Zhejiang University, China. He currently serves on the editorial boards of several leading academic journals including, Food Security, Agricultural Economics Research Review, African Journal of Agricultural and Resource Economics, Journal of Sustainable Development, and Food and Nutrition Bulletin. Dr. Babu received his Ph.D. and M.S. in economics from Iowa State University, where he was awarded the Outstanding Young Alumnus Award for his services to global development. Dr. Pramod K. Joshi is the Director for South Asia, International Food Policy Research Institute, New Delhi. He is a recipient of the Dr RC Agarwal Life Time Achievement Award and a Fellow of the National Academy of Agricultural Sciences, and Indian Society of Agricultural Economics. He is the President of the Agricultural Economics Research Association-India.